Several causes of gingival hyperplasia are known, and the most recognized is drug-induced gingival enlargement. Furthermore, causes of congenital gingival enlargement include hereditary and metabolic disorders, such the fetal valproate syndrome. See the image below. Swelling of the gingival mucosa around the right lower canine and multiple areas of erythema, erosions, and bleeding throughout the upper gingival mucosa. Other intrinsic risk factors include the susceptibility of some subpopulations of fibroblasts and keratinocytes to phenytoin, cyclosporine, and/or nifedipine, and the number of Langerhans cells present in oral epithelium. [19, 20, 21] The latter appears to be related to the presence of inflammation and dental plaque. Several studies have shown that the interaction of phenytoin, cyclosporine, and nifedipine with epithelial keratinocytes, fibroblasts, and collagen can lead to an overgrowth of gingival tissue in susceptible individuals. Phenytoin has been shown to induce gingival overgrowth by its interaction with a subpopulation of sensitive fibroblasts. Cyclosporine has been suggested to affect the metabolic function of fibroblast (eg, collagen synthesis, breakdown). The mechanism of a cyclosporine-induced fibroblast overgrowth in both adults and children may be linked to the steps involving fibroblast proliferation and the cytokine network , including interleukin (IL)–6, IL-8, IL-1β, transforming growth factor-β1, and prostaglandin E2. Nifedipine, which potentiates the effect of cyclosporine, reduces protein synthesis of fibroblasts. A review of existing literature shows that a cofactor clearly is needed to induce gingival overgrowth. [5, 19, 21, 25, 26, 27, 28, 29, 30] In fact, several lines of evidence point to a modulation of inflammatory processes. Gingival overgrowth is a rare condition, and no population-based or epidemiologic studies exist in the United States. Incidence rates are reported from case-series studies. The prevalence of phenytoin-induced gingival overgrowth is estimated at 15-50% in patients taking the medication. The prevalence for cyclosporine transplant recipient patients is 27%; however, these numbers should be interpreted with caution. The incidence of gingival hyperplasia has been reported as 10-20% in patients treated with calcium antagonists in the general population. Clinicians should look at the population represented within each particular study (ie, young persons with epilepsy, recipients of transplants). No incidence or prevalence epidemiologic data is available on gingival overgrowth worldwide. In India, 57% of epileptic children aged 8-13 years who were undergoing phenytoin monotherapy developed gingival overgrowth within 6 months of treatment. No racial predilection exists for the onset of drug-induced gingival overgrowth. No sexual predilection exists for drug-induced gingival overgrowth, although in one study, males were 3 times more likely than females to develop gingival overgrowth with calcium antagonists. No mortality is associated with gingival enlargement. Morbidity can be severe in some cases because of gross overgrowth of gingival tissue, which can lead to gingival bleeding, pain, teeth displacement, and periodontal disease. The prognosis is better if patients maintain regular oral hygiene and plaque control. Inform patients of the risk of developing gingival enlargement secondary to therapy and the role of oral health in minimizing complications from therapy. Advise patients to see a pedodontist, a periodontist, and an oral medicine dentist for a baseline evaluation; full mouth x-ray films; tooth extractions, if needed; and dental hygiene before transplant or the use of any drug known to induce gingival overgrowth. For patient education resources, see the Oral Health Center as well as Gingivitis and When to Visit the Dentist. Rodriguez-Vazquez M, Carrascosa-Romero MC, Pardal-Fernandez JM, Iniesta I. Congenital gingival hyperplasia in a neonate with foetal valproate syndrome. Neuropediatrics. 2007 Oct. 38(5):251-2. [Medline]. Thomason JD, Fallaw TL, Carmichael KP, Radlinsky MA, Calvert CA. Gingival hyperplasia associated with the administration of amlodipine to dogs with degenerative valvular disease (2004-2008). J Vet Intern Med. 2009 Jan-Feb. 23(1):39-42. [Medline]. Vorkas CK, Gopinathan MK, Singh A, Devinsky O, Lin LM, Rosenberg PA. Epilepsy and dental procedures. A review. N Y State Dent J. 2008 Mar. 74(2):39-43. [Medline]. Mohan RP, Rastogi K, Bhushan R, Verma S. Phenytoin-induced gingival enlargement: a dental awakening for patients with epilepsy. BMJ Case Rep. 2013 Apr 23. 2013:[Medline]. Dhingra K, Prakash S. Gingival overgrowth in partially edentulous ridges in an elderly female patient with epilepsy: a case report. Gerodontology. 2012 Jun. 29(2):e1201-6. [Medline]. Cornacchio AL, Burneo JG, Aragon CE. The effects of antiepileptic drugs on oral health. J Can Dent Assoc. 2011. 77:b140. [Medline]. Bhatia V, Mittal A, Parida AK, Talwar R, Kaul U. Amlodipine induced gingival hyperplasia: a rare entity. Int J Cardiol. 2007 Nov 30. 122(3):e23-4. [Medline]. Kaur G, Verhamme KM, Dieleman JP, et al. Association between calcium channel blockers and gingival hyperplasia. J Clin Periodontol. 2010 Jul. 37(7):625-30. [Medline]. Breitung K, Remmerbach TW. [Gingival hyperplasia as side effect of the calcium channel blocker amlodipine]. Schweiz Monatsschr Zahnmed. 2010. 120(6):525-31. [Medline]. Aldemir NM, Begenik H, Emre H, Erdur FM, Soyoral Y. Amlodipine-induced gingival hyperplasia in chronic renal failure: a case report. Afr Health Sci. 2012 Dec. 12(4):576-8. [Medline]. [Full Text]. Csifó-Nagy B, Hulik E, Zsoldos GM, Gera I. [Surgical correction of excessive gingival enlargements. Case studies]. Fogorv Sz. 2013 Jun. 106(2):61-70. [Medline]. Charles N, Ramesh V, Babu KS, Premalatha B. Gene polymorphism in amlodipine induced gingival hyperplasia: a case report. J Young Pharm. 2012 Oct. 4(4):287-9. [Medline]. [Full Text]. Jorgensen MG. Prevalence of amlodipine-related gingival hyperplasia. J Periodontol. 1997 Jul. 68 (7):676-8. [Medline]. Gelfand EW, Cheung RK, Grinstein S, Mills GB. Characterization of the role for calcium influx in mitogen-induced triggering of human T cells. Identification of calcium-dependent and calcium-independent signals. Eur J Immunol. 1986 Aug. 16 (8):907-12. [Medline]. Bahamondes C, Godoy J. [Cyclosporine-induced gingival hyperplasia: report of one case]. Rev Med Chil. 2007 Mar. 135(3):370-4. [Medline]. Lafzi A, Farahani RM, Shoja MA. Phenobarbital-induced gingival hyperplasia. J Contemp Dent Pract. 2007 Sep 1. 8(6):50-6. [Medline]. Moffitt ML, Bencivenni D, Cohen RE. Drug-induced gingival enlargement: an overview. Compend Contin Educ Dent. 2013 May. 34(5):330-6. [Medline]. Gursoy UK, Sokucu O, Uitto VJ, et al. The role of nickel accumulation and epithelial cell proliferation in orthodontic treatment-induced gingival overgrowth. Eur J Orthod. 2007 Dec. 29(6):555-8. [Medline]. Hyland PL, Traynor PS, Myrillas TT, et al. The effects of cyclosporin on the collagenolytic activity of gingival fibroblasts. J Periodontol. 2003 Apr. 74(4):437-45. [Medline]. Kinane DF, Drummond JR, Chisholm DM. Langerhans cells in human chronic gingivitis and phenytoin-induced gingival hyperplasia. Arch Oral Biol. 1990. 35(7):561-4. [Medline]. Salman BN, Vahabi S, Movaghar SE, Mahjour F. Proliferative and inductive effects of Cyclosporine a on gingival fibroblast of child and adult. Dent Res J (Isfahan). 2013 Jan. 10(1):52-8. [Medline]. [Full Text]. Devanna R, Asif K. Interdisciplinary management of a patient with a drug-induced gingival hyperplasia. Contemp Clin Dent. 2010 Jul. 1(3):171-6. [Medline]. [Full Text]. Tejnani A, Mani A, Sodhi NK, et al. Incidence of amlodipine-induced gingival overgrowth in the rural population of Loni. J Indian Soc Periodontol. 2014 Mar. 18(2):226-8. [Medline]. [Full Text]. Srivastava AK, Kundu D, Bandyopadhyay P, Pal AK. Management of amlodipine-induced gingival enlargement: Series of three cases. J Indian Soc Periodontol. 2010 Oct. 14(4):279-81. [Medline]. [Full Text]. Modeer T, Anduren I, Lerner UH. Enhanced prostaglandin biosynthesis in human gingival fibroblasts isolated from patients treated with phenytoin. J Oral Pathol Med. 1992 Jul. 21(6):251-5. [Medline]. Schincaglia GP, Forniti F, Cavallini R, Piva R, Calura G, del Senno L. Cyclosporin-A increases type I procollagen production and mRNA level in human gingival fibroblasts in vitro. J Oral Pathol Med. 1992 Apr. 21(4):181-5. [Medline]. Tipton DA, Stricklin GP, Dabbous MK. Fibroblast heterogeneity in collagenolytic response to cyclosporine. J Cell Biochem. 1991 Jun. 46(2):152-65. [Medline]. Sonmez S, Cavdar C, Gunduz C, et al. Do MMP-1 levels of gingival fibroblasts have a role in the gingival overgrowth of cyclosporine-treated patients?. Transplant Proc. 2008 Jan-Feb. 40(1):181-3. [Medline]. Chiu HC, Lan GL, Chiang CY, et al. Upregulation of heme oxygenase-1 expression in gingiva after cyclosporin A treatment. J Periodontol. 2008 Nov. 79(11):2200-6. [Medline]. Lin CJ, Yen MF, Hu OY, et al. Association of galactose single-point test levels and phenytoin metabolic polymorphisms with gingival hyperplasia in patients receiving long-term phenytoin therapy. Pharmacotherapy. 2008 Jan. 28(1):35-41. [Medline]. Daly CG. Resolution of cyclosporin A (CsA)-induced gingival enlargement following reduction in CsA dosage. J Clin Periodontol. 1992 Feb. 19(2):143-5. [Medline]. Fu E, Nieh S, Chang HL, Wang SL. Dose-dependent gingival overgrowth induced by cyclosporin in rats. J Periodontol. 1995 Jul. 66(7):594-8. [Medline]. Brochet MS, Harry M, Morin F. Nifedipine induced gingival hyperplasia in pregnancy: a case report. Curr Drug Saf. 2016 Apr 26. [Medline]. George A, George SP, John S, George N, Joe S, Mathew R. Changes in Inflammatory Markers in Bacterial- and Nifedipine-Induced Gingival Inflammation. J Int Oral Health. 2015. 7 (Suppl 2):64-7. [Medline]. Carty O, Walsh E, Abdelsalem A, MaCarthy D. Case report: drug-induced gingival overgrowth associated with the use of a calcium channel blocker (amlodipine). J Ir Dent Assoc. 2015 Oct-Nov. 61 (5):248-51. [Medline]. De Rop C, Picksak G, Stichtenoth DO. [Gingival hyperplasia]. Med Monatsschr Pharm. 2010 Jan. 33(1):23-4. [Medline]. Muralikrishna T, Kalakonda B, Gunupati S, Koppolu P. Laser-Assisted Periodontal Management of Drug-Induced Gingival Overgrowth under General Anesthesia: A Viable Option. Case Rep Dent. 2013. 2013:387453. [Medline]. [Full Text]. D'Errico B, Albanese A. Drug-induced gingival hyperplasia, treatment with diode laser. Ann Stomatol (Roma). 2013. 4:14. [Medline]. [Full Text]. Cafaro A, Arduino PG, Broccoletti R, Romagnoli E. Low level laser therapy (LLLT) as adjuvant in the management of drug induced gingival hyperplasia: a case report. Ann Stomatol (Roma). 2013. 4:8-9. [Medline]. [Full Text]. Cebeci I, Kantarci A, Firatli E, Carin M, Tuncer O. The effect of verapamil on the prevalence and severity of cyclosporine-induced gingival overgrowth in renal allograft recipients. J Periodontol. 1996 Nov. 67(11):1201-5. [Medline]. Conde SA, Aarestrup FM, Vieira BJ, Bastos MG. Roxithromycin reduces cyclosporine-induced gingival hyperplasia in renal transplant patients. Transplant Proc. 2008 Jun. 40(5):1435-8. [Medline]. Kwun WH, Suh BY, Kwun KB. Effect of azithromycin in the treartment of cyclosporine-induced gingival hyperplasia in renal transplant recipients. Transplant Proc. 2003 Feb. 35(1):311-2. [Medline]. Nash MM, Zaltzman JS. Efficacy of azithromycin in the treatment of cyclosporine-induced gingival hyperplasia in renal transplant recipients. Transplantation. 1998 Jun 27. 65(12):1611-5. [Medline]. Wirnsberger GH, Pfragner R. Comment on "Efficacy of azithromycin in the treatment of cyclosporine-induced gingival hyperplasia in renal transplant recipients" by Nash and Zaltzman. Transplantation. 1999 May 15. 67(9):1289-91. [Medline]. Ramalho VL, Ramalho HJ, Cipullo JP, Azoubel R, Burdmann EA. Comparison of azithromycin and oral hygiene program in the treatment of cyclosporine-induced gingival hyperplasia. Ren Fail. 2007. 29(3):265-70. [Medline]. Macartney C, Freilich M, Odame I, Charpentier K, Dror Y. Complete response to tacrolimus in a child with severe aplastic anemia resistant to cyclosporin A. Pediatr Blood Cancer. 2009 Apr. 52(4):525-7. [Medline]. Nassar CA, Nassar PO, Andia DC, Guimaraes MR, Spolidorio LC. The effects of up to 240 days of tacrolimus therapy on the gingival tissues of rats--a morphological evaluation. Oral Dis. 2008 Jan. 14(1):67-72. [Medline]. Enlarged upper and lower gingival mucosa in a partially edentulous patient. Notice how the overgrown tissue tends to engulf the teeth. 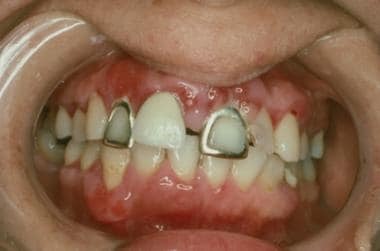 Poor oral hygiene and poor dentition are the most likely contributing factors in this patient receiving immunosuppressive therapy. A palatal view of enlarged upper and lower gingival mucosa in a partially edentulous patient. Notice the severity of the gingival enlargement. If left untreated, patients develop severe periodontal disease and lose teeth. The authors and editors of Medscape Reference gratefully acknowledge the contributions of previous author, Piamkamon Vacharotayangul, DDS, PhD, to the development and writing of this article.